Click here to download the free Android App of this website. ഈ വെബ്‌സൈറ്റിന്റെ സൗജന്യ ആന്‍ഡ്രോയ്ഡ് മൊബൈൽ ആപ്ലിക്കേഷന്‍ ഡൗണ്‍ലോഡ് ചെയ്യുന്നതിന് ഇവിടെ ക്ലിക്ക് ചെയ്യുക. Visits: 45496 persons viewed this recipe. Though many think the pulao to be an inferior dish to biriyani, actually the mouth watering quick recipe featuring chicken, basmati rice and aromatic spices is an awesome delicacy to try. Stimulating the taste buds and mesmerizing with its wonderful aroma, the pulao is nothing less than the exciting biriyani. The chicken pulao comes to your rescue when the thought of preparing chicken biriyani looks like too time consuming and difficult. Within a matter of a few minutes, you can treat yourself with the fragrant basmati rice flavored with spicy chicken. 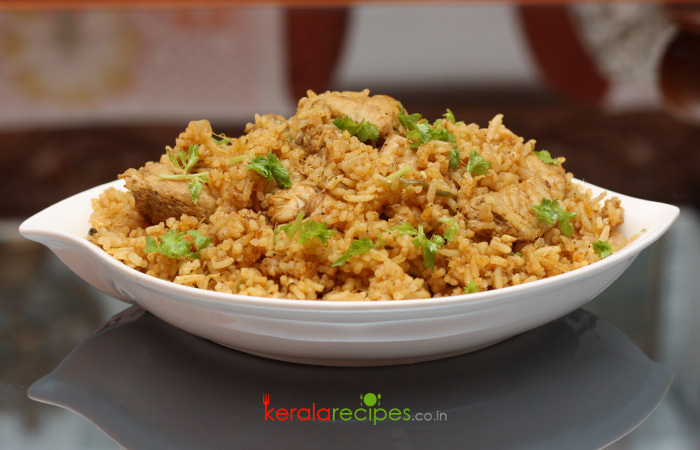 Chicken pulao recipe never lets down any chef on any occasion. Cut the chicken into bite size pieces, clean it, drain off the water and keep aside. Ginger-garlic paste, pepper powder, curd and salt should be made as a paste. Marinate chicken pieces with this paste and keep aside for minimum 20 minutes. Wash rice, drain it and keep aside. Chop the onion and coriander leaves. Slit the green chillies length wise. Heat 2 table spoon of oil in a non-stick cooking vessel. Put cinnamon, cloves and green cardamoms. Stir it for 30 seconds. Put onion, green chilli and salt. Sauté it well. When the onions turns golden brown, reduce the heat and put coriander powder, turmeric powder and garam masala. Stir it for 1 minute. To this, add marinated chicken pieces and half of the chopped coriander leaves. Sauté on a medium heat for 5 minutes. Proceed to add rice and mix it well. Pour 3½ cup of water into it and combine well. Put salt to taste. Turn the heat to high and bring it to a boil. Now, reduce the heat and cook it covered about 15 minutes. Chicken pulao is ready. Turn off the heat and put remaining coriander leaves. Let it closed for another 10 minutes allowing all the spices to steep into it. Serve hot with salad/raita and enjoy the chicken pulao. 1) Adjust the level of spices to suite your taste. 2) Cooking oil and be replaced by ghee or butter. Copyright © 2013 - 2019 Shaan Geo. All Rights Reserved. Myself, Shaan Geo basically a Software Engineer started my career in IT Industry. I have had a passion for food and cooking from an early age. This habit made me keep an eye out for the new variants of food and the different cuisines where ever I go. According to me cooking is an equal-opportunity talent and I find that anybody can cook. It is not limited by the age, profession, caste, colour or creed of a person. What is needed is the love for cooking. For me passion for cooking does not stop in the kitchen, when I travel, I continue to be inspired by eating in some of the best restaurants around the world. Click here to download the free Android Application of this website. Hi, it’s nice and comes out very tasty. Jiby, Thanks for the feedback. Hai Shaan.. so happy to find and follow your site.. for last 2 hours I was going through your recipes. From across the miles I got aroma of Kerala cooking to California .. I am the author of food blog “Lemon n spice” which i started in 2009. Soon I will try your khuboos recipe n will update the feed back in your site. Hello Shaan, your recipes are really easy to follow. But now I am in Italy so find some difficulties to find all the ingredients. So I request you to add some recipes which are needed a few and common ingredients.Thank you. Maria, Thanks for the visit and feedback. I will try to include more recipes having ingredients easily available. Hope to see you here often. Awesome one… this turned out to be more tasty & easier to cook, compared to Biriyani… Thanks a lot..
You are welcome Sheetal, Thank you very much for the feedback. Thanks for this recipe. It is much easier than chicken biriyani.. I used to make vagetable pulao, but I never tried chicken pulao, sure I’ll prepare this… Thanks once again. You are welcome Mars. Hope you will share the feedback after trying this recipe. Thanks for the comment. For the first time I am going to prepare this chicken pulao. Mala, Thanks for the comment. Hope the chicken pulao recipe will work out well for you. Hi Sir, I cooked the recipe and it came out very well. I have gone through other recipes too and it is easy to follow even for a beginner. Keep posting recipes. Thank you. Neethu, Thank you very much for the feedback. I will try to add more recipes when time permits. Hope to see you here often. Hi Shaan, I have already tried your chicken biriyani and chicken curry. both came out well. For tomorrow Sunday I am going to try your chicken pulao. Your recipes are too easy to follow. Thank you so much. Hello Shaan, Recipes you have posted looks yummy and I have tried the chicken biryani recipe. It came out so delicious. Shaan can you try posting step by step procedures, it would be more helpful. Thanks. Shal, Thanks for trying the recipe and also for the feedback. Sorry I didn’t get what you mean by step by step procedure. You mean adding photos of each step?